Welcome to Casa de Linda Art Studio — in Wimberley! 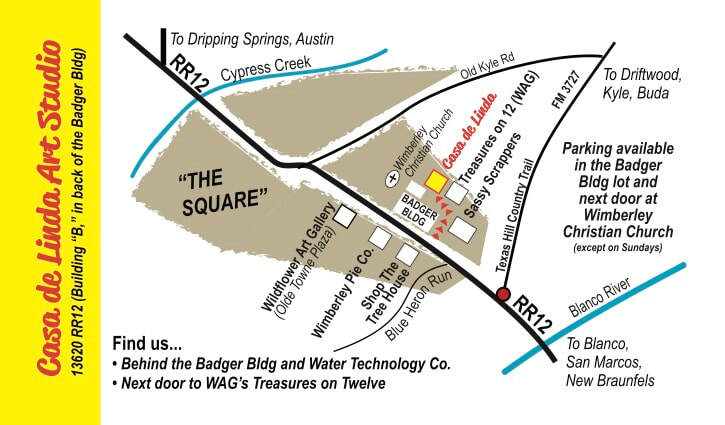 Please note that Casa de Linda Art Studio is located in Wimberley (not New Braunfels). Open by appointment only. Contact linda@casadelinda.com for more information. Greetings from the Texas Hill Country and from the heart of Wimberley, Texas. Come paint with us! Students can join our on-going, weekly adult acrylic painting classes anytime! Pay for 6 weeks at a time and re-enroll as long as you want to keep painting. Click here for a quick link to the Acrylic Painting page. Need to jump start your muse? No better place to start than at the beginning with drawing! Click here. Check out our 6-week courses. Winter schedule is ready for enrollments!. Click here to learn more. We have a great program for children ages 7-14 for Summer 2019. Schedule is ready and the online registration will be activated soon. Click here to see what's planned for this summer. PLUS PAINTING PARTIES! NEW DESIGNS AVAILABLE!! We are taking bookings for our Art-2-Gogh Painting Parties for Adults! Click here to learn more. Please "stay tuned" and check back for more news and updates. If you have not already done so, we encourage you to sign up for our e-newsletters. As class schedules are posted, we'll e-mail everyone on the list. Also, please note that when you sign up for our newsletters, you'll also occasionally get news about my "life an artist" and our Wildflower Art Gallery in Wimberley. For more information, please visit www.lindacalvertjacobson.com. Again, thank you for your interest in Casa de Linda Art Studio.